Some of the monthly questions posed by the Classic Club have been fiendishly difficult to answer and involved much chewing of pencils and furrowing of eyebrows on my part before I could even think of a coherent response. But March’s question hasn’t created anywhere the same amount of angst. What is your favourite “classic” literary period and why? For me, there is no contest; it has to be the nineteenth century. This is a period which witnessed massive and lasting change through the twin forces of industrial revolution and political revolution in France. The writers of the period turned to the novel as a way of representing and exploring those social changes. Reading many of the novels of this period gives me a chance to indulge in my love of history, particularly at the human level. Want to know what life was like for single women of no independent means? Read the Bronte sisters. Want to know about the effects of the new spirit of social mobility and economic potential? Read Dickens or Gaskell. If your interests lie beyond the borders of the United Kingdom, hop over to France to learn about working conditions for miners or the poor of Paris courtesy of Emile Zola or hitch a lift on a boat up the Congo river with Joseph Conrad for a look at the effects of colonisation. The variety of subject matter was also echoed by a tremendous variety in style and form. At the start of the century the novel was still a relatively new (novel) form of writing. Through the early writers of the period it began to take shape. But once they’d found their feet as it were, they began to have even more fun with it, reshaping and reshaping it as they experimented with new approaches. They pushed against the boundaries as they looked for the form of writing that best gave expression to their ideas. Within the span of 100 years we moved from romance and the Gothic through the realism of George Eliot to the sensationalism of Wilkie Collins, the pastoral romances of Thomas Hardy and ending on the cusp of the new century with the emergence of the stream of consciousness style of narrative. Diversity of form and diversity of subject matter make for a winning combination in my book. 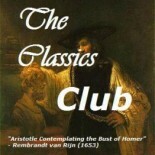 Posted on March 18, 2014, in Classics Club, History of the novel and tagged Nineteenth century writers. Bookmark the permalink. 11 Comments. I only do the easy ones! 19th century has some of the best classics! I haven’t participated in classics club meme’s yet. I should! They also knew how to tell a really good story and I sometimes think that the writers we think of as producing the classics of the twentieth and twenty-first centuries forgot how important that actually is. That’s so true Alex. It’s maybe why I get frustrated with some modern fiction, I feel they are pushing an agenda too much and forgot about the entertainment factor. Who do you class as the transcendentalists Stephanie? The transcendentalists would be Emerson, Thoreau and Margaret Fuller but I also like the group that followed them, Hawthorne, Melville and Whitman who I think are classified as late romantics, but time periods for literature are rather fluid and ever changing it seems! I have missed way too many classic club monthly memes. I agree with you though that 19th century has some of the best classics. I enjoyed this post. The 19th century is my favorite period as well.